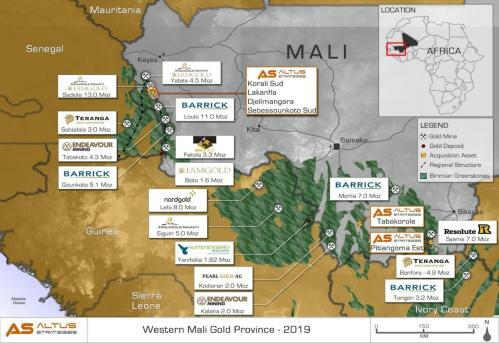 SOUTHERN MALI / ACCESSWIRE / April 9, 2019 / Altus Strategies Plc (AIM: ALS & TSX-V: ALTS), the Africa focused exploration project generator, announces that it has defined a series of drill targets to test the potential of expanding the Company's 100% owned Tabakorole gold project ("Tabakorole" or the "Project") located on the Massagui gold belt in southern Mali, approximately 100km southwest of the multi-million ounce Morila gold mine. High grade intercepts including 18 m at 6.05 g/t Au from 12 m and 24 m at 2.53 g/t Au from 48 m were not incorporated in the historical resource estimate. See "Tabakorole Project: Historical resource" and "Cautionary note regarding historical data"
As announced by the Company on 7th February 2019, Tabakorole is subject to a non-binding Term Sheet for a Joint Venture with Indiana Resources Ltd, which is listed on the Australian Securities Exchange ("ASX"). 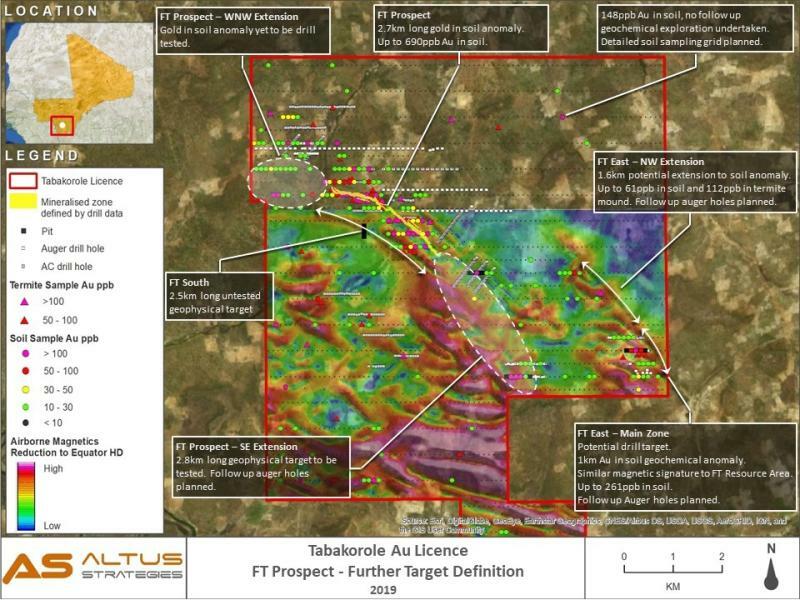 "Our detailed review of historical data on the Tabakorole gold project has defined a number of priority drill targets which have the potential to expand the FT prospect, as well as outlining new prospects within the licence. 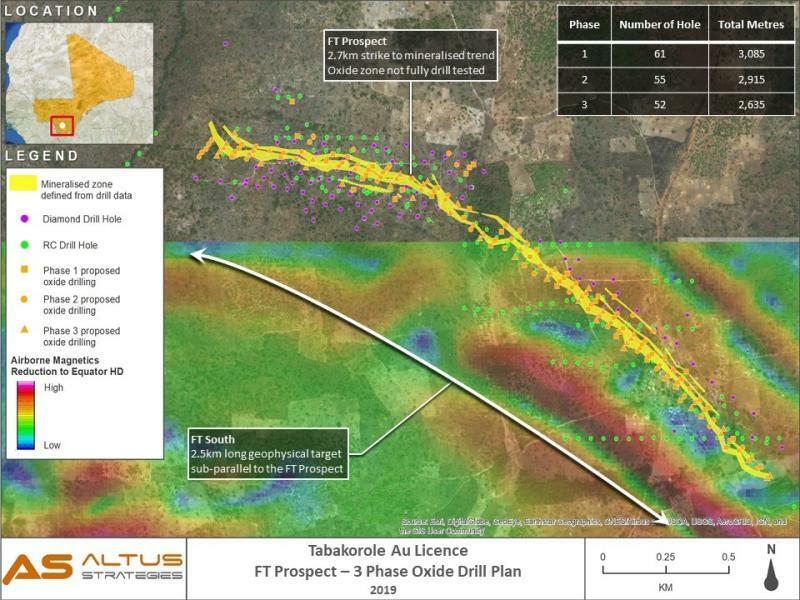 ''Historical drilling intersections at the FT prospect, indicate a number of areas where high grade intercepts, including 18 m at 6.05 g/t Au from 12 m (10FLRC-12A) and 24 m at 2.53 g/t Au from 48 m (10FLRC-01A) were discovered but not followed up with infill drilling by previous operators. These drill holes were completed in 2010, while the historical mineral resource estimate was completed in 2007. We believe these targets offer significant upside potential within and proximal to the current historical resource area. ''Elsewhere, analysis of historical airborne magnetic data has established the presence of the yet to be tested 'FT South' prospect. FT South is approximately 2.5 km long and runs broadly parallel to the FT prospect located 600 m to the north. ''Indiana is currently completing its due diligence on the Tabakorole and Lakanfla projects as part of the Term Sheet announced on 7th February 2019 and subsequently extended until 6th May 2019 on 13th March 2019. We look forward to updating shareholders on this proposed transaction in due course." The resource was prepared in accordance with NI 43-101 by H. Andrew Daniels, Consulting Geologist, P.Geo in a report entitled "Technical Report on the Mineral Resource Update, June 2007 FT Project Mali, West Africa", dated July 27, 2007 and filed on SEDAR on July 27 2007 by North Atlantic Resources Ltd. A Qualified Person has not done sufficient work to classify this historical estimate as current mineral resources and Altus is not, therefore, treating this historical estimate as a current mineral resource. However, it remains relevant to the Project and Altus believes it is also reliable. To verify this historical estimate so that the resource can be considered current, Altus would be required to contract a qualified and independent consultant to review historical drilling data and prepare a resource estimate in accordance with NI 43-101. 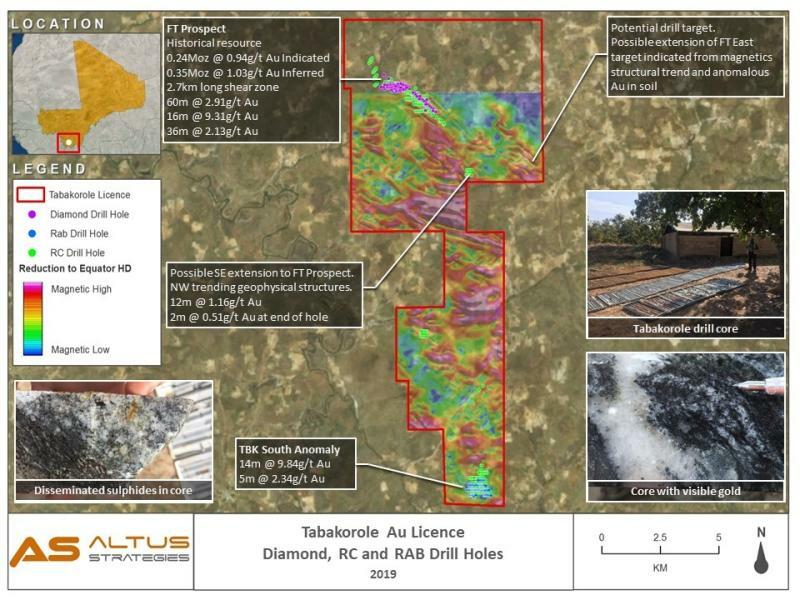 Location of the Tabakorole project with Altus' other projects in Mali is shown in Figure 1. 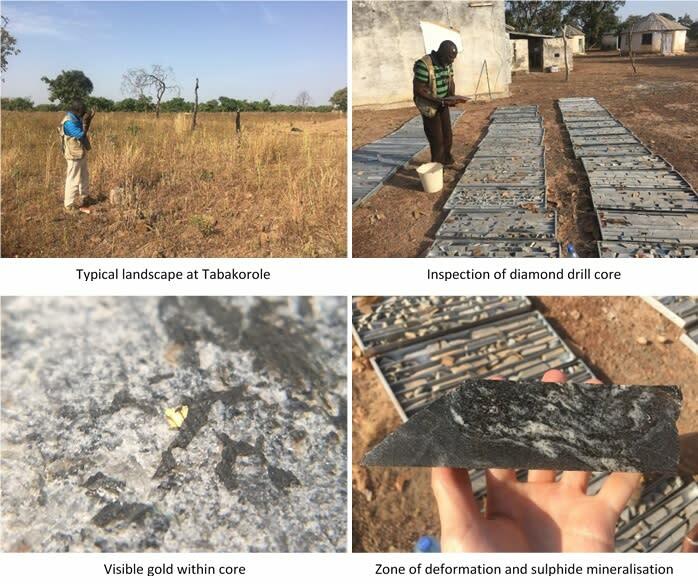 On 7th February 2019 the Company announced the signing of a non-binding Term Sheet for a Joint Venture ("JV") with ASX listed Indiana Resources Ltd on the Company's Lakanfla and Tabakorole gold projects (the "Projects") located in western and southern Mali respectively. On 13th March, 2019 the Company announced that it had granted Indiana a thirty day extension (to now end on 6th May 2019) for the completion of due diligence. Subject to entering a definitive agreement with Altus, Indiana will have the option to earn up to an 85% interest in Legend Mali (BVI) II Inc. ("Legend"), a wholly owned subsidiary of the Company which holds a 100% interest in the Projects. The technical disclosure in this regulatory announcement has been read and approved by Steven Poulton, Chief Executive of Altus. A graduate of the University of Southampton in Geology (Hons), he also holds a Master's degree from the Camborne School of Mines (Exeter University) in Mining Geology. He is a Fellow of the Institute of Materials, Minerals and Mining and has over 20 years of experience in mineral exploration and is a Qualified Person under the AIM rules and National Instrument 43-101. 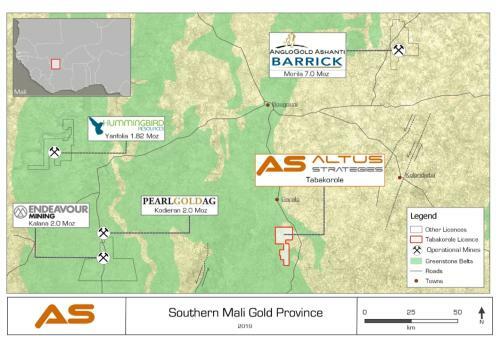 Altus is a London (AIM:ALS) and Toronto (ALTS.V) listed, diversified and Africa focused mineral exploration project generator. Through our subsidiaries we discover new projects and attract third party capital to fund their growth, development and ultimately exit optionality. This strategy enables Altus to remain focused on the acquisition of new opportunities to be fed into the project generation cycle and aims to minimise shareholder dilution. Our business model is designed to create a growing portfolio of well managed and high growth potential projects and royalties, diversified by commodity and by country. Altus currently has eighteen projects in six commodities across six countries. We aim to position our shareholders at the vanguard of value creation, but with significantly reduced risks traditionally associated with investments in the mineral exploration sector.